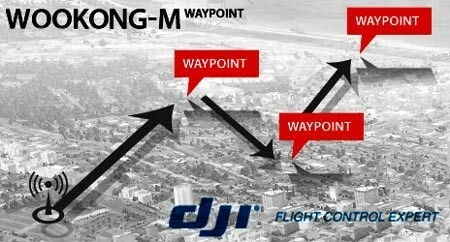 The DJI Wookong WKM Multi Way Point upgrade package enables users which have the 1 way point option already to upgrade to the full 50 waypoints on the DJI Wookong WKM; this is an upgrade package, it's to be use with the DJI WKM flight controller and the WKM M View when upgrading from the 1 included way point. The DJI WKM Multi Way Point upgrade gives you extra tools for improved flight operation and control, using the Click and Go function allows the pilot to draw a single flight route on a 3D map, the Multi Way Point allows 50 way points to be added. You can assign the altitude and flight speed to a single / multi destination; the altitude, speed and destination end point can be changed on the fly with flight path tracking. Using the Multi Way Point function enhances the DJI Wookong WKM M View features, which brings you more exciting flight experiences and allows a greater level of control. Please note: This is an upgrade package for users that have the DJI Wookong WKM and the DJI Wookong M View with the 1 way point option activated. No Data Radio or DJI Wookong WKM is included.